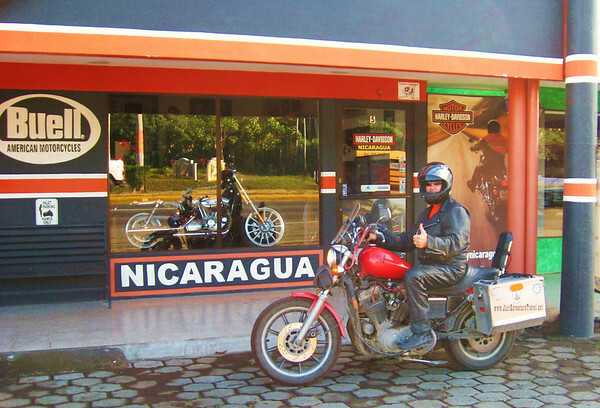 salcar, an around the world motorcycle adventurer emailed me after hearing we were in Nicaragua, he says he is living in Managua Nicaragua and asks if we need any help and suggested we have a beer or two together some time, Great. 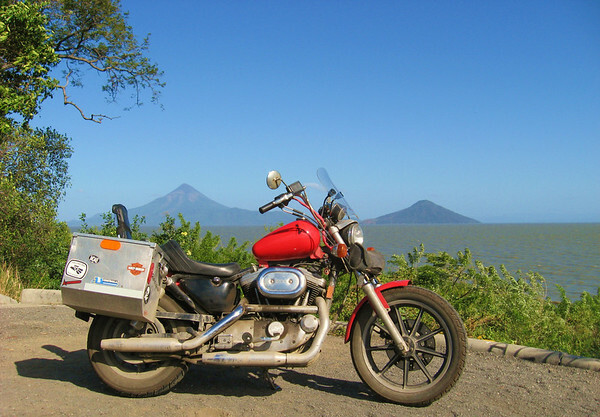 I write back with a question about extending the 30 days clearance on our motorcycle for Nicaragua with out having to leave the country and come back, which is the plan. Hi did some research and told me what to do and where to go to get an extension on a motorcycle customs papers. 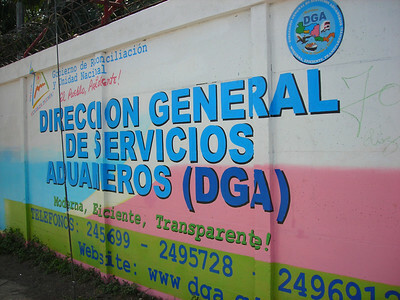 Now the plan is to go to the Direccion Generale de Aduana (DGA) office in Managua near the airport. Cool… on-line google search "Direccion Generale Aduana Managua Nicaragua" yealds a solid hit with an address. Next the google map of Managua shows the street the DGA is on, the same street the airport is on, just like salcar said. Oh Yeah! I knew this was going to be fun. We are staying at a great apartment just outside of Granada and we would like to stay at least another month. 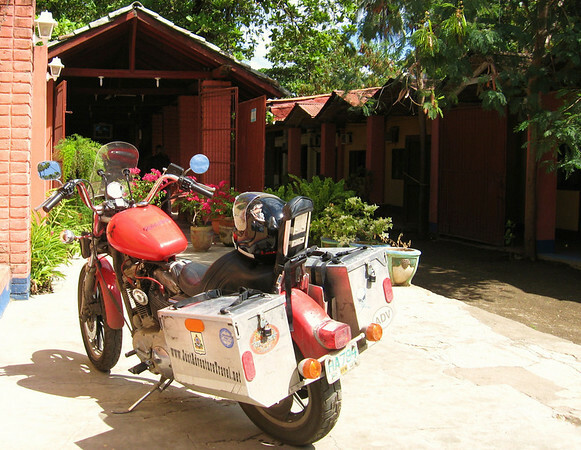 We have already been in Nicaragua for 10 days and don't want to pay for a month until we can extent the clearance on the bike. 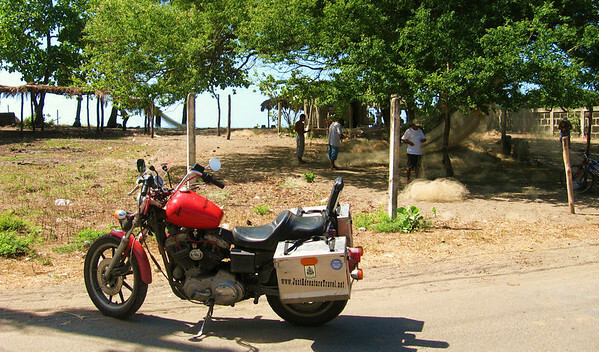 Filled with anticipation the next day I am off and out on the highway with all the motorcycle papers waiting to flag down the first bus with a guy hanging out yelling "Managua, Managua, Managua"
The bus completely filled up by the time we hit Managua. Managua is the largest city in Nicaragua and is reported to be the most difficult city in all of Central America to navigate through. This is due to the lack of a city center and streets have very few markings, and the city is spread way out, thus the decision to take the bus. Anyway, a bus ride in Latin America to me is nothing but pure adventure pleasure. Having no idea where the bus is going to take me the plan is to just keep on it, it will eventually come to some bus terminal center, somewhere. The bus finally pulls into a big bus center. I wait until everyone exits off then ask the driver if he knows which way Carretera Norte is. The driver tells me to sit back down in the bus and he will take me somewhere, cool. He proceeds to drive through the terminal area pass dozens of buses. I'm the only person on the bus. He stops near the end and points to a bus saying "Nicaragua" The bus he is pointing to has "Nicaragua" painted on the back of the bus, Sweeeet. I thank the driver for the help and walk over to the bus he pointed to. Asking the helper of thist bus if he goes to Carretera Norte "Si". All right. One person drives the bus, one person solicits people onto the bus by yelling out in a musical rhythm where the bus is headed to, this person is also responsible for taking money based on how far people are riding. It's another 15 minutes until I figure the bus is on the street, Carretera Norte. After asking a guy sitting next to me wearing military fatigues if this is Carretera Norte. He says "Si". Next I ask him about the aduana office. He motions for me to sit tight a while and he will show me. 5 minutes later he says to get off after 3 more stops. I thank him and get off the bus, right in front of an aduana (customs) building, right next to the airport, just like salcar said. "this is too easy" I say, It was. After talking with several people outside I finally go in a building and talk to a few more very helpful people. After being walked around and and talking with several other people the last guy finally knows exactly whats going on, this is the wrong adauna. He points down Carretera Norte and says "CocaCola, CocaCola, enfrente CocaCola" The correct duana office is down the road across from a sign or building that says CocaCola. OK, on it. The address is "Kilometer 4 1/2 Carretera Norte" After walking a mile is a bar named "Bar 8 1/2" All right, I calculate 4 kilometers to walk to get to the aduana correct office. There are no addresses anywhere, not on any buildings or roads. It is alweays a guess how far 4 kilometers is while walking along. So I also talk with people along the way constantly looking for cleus. A few people in an import offices point me up the road, super. I walk in the building behind others. A guard at the entrance 'wands' the guy in front of me. I'm next. I just pull out my big switchblade and hand it to the guard. The guard says something ending with "amable" (kind) and puts the knife in his shirt pocket. I talk with a receptionist and tell her what I want to do. She tells me I need to get a copy of my passport, motorcycle title and motorcycle customs papers, all in Spanish. I get it. She points me across the street. Across the street is a CocaCola factory, a Nissan dealership and a gas station. I ask a guy at the gas station, he points me across the street to some electronics parts store. The parts store points me back across the street. (What?) I walk across the street again and down a residential alley. Lo and behold I see a house with a hand written sign (Photocopies) Unreal. I knock on the door and a super nice couple makes me 2 copies of my 3 documents, bada bing, bada bang…. Ok, the aduana office needs to contact the border crossing post that screwed up my papers and get a confirmation that they messed it up before I can get my extension. A manager tells me I have to come back tomorrow and that she will call me at the hotel when it's all ready. The clerk refunds me the $30 dollars I paid. I go marching off happy knowing I will get this done eventually. I walk through Managua for over 2 hours until I'm sure I'm on the highway leading to Masaya. There I flag down a taxi to take me about 4 or 6 kilometers up the road to where I know a bus will be running back to my hotel. There I tell the driver to stop at a bus stop. 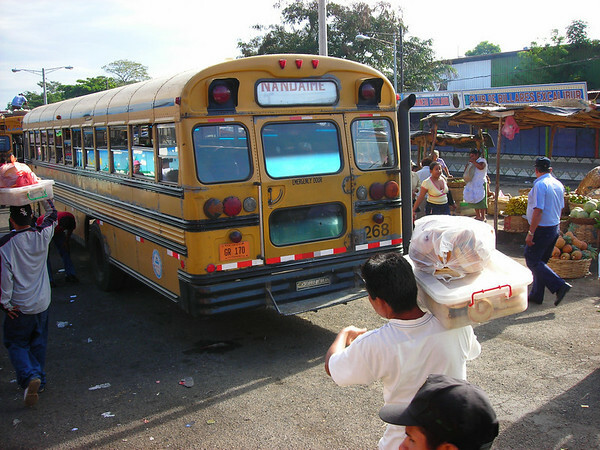 I pay him $2.50 and wait for a bus yelling "Masaya, Masaya, Masaya"
The bus ride from the hotel to Managua, 25 miles cost 75 cents. A bus ride in town cost 13 cents. Taxis in Latin America are cheap but there are no meters. Asking the price ahead of time pretty much assures that you will pay double. The way I do it is 'guesstimate' what the price will be while having the exact cash in hand when the taxi stops. While opening the door to let myself out I hand the cash to the driver while thanking him, never looking at him. This has always worked for me and the cost of the taxis are about the same as a good tip alone in the US. 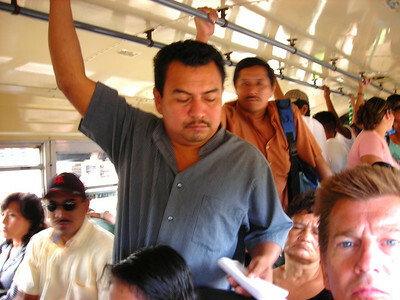 Did I say I like taking public transportation in Latin America……. I'm back at the hotel. I knew it was too good to be true that I would receive a phone call from the aduana office telling me everything is ready. I just plan to return to Managua the next day and wing it. At the hotel another couple arrived by van from the state of Washington. They also want to stay a month here. I tell them of my situation. They soon realize they are in the same boat as us. They need to get an extension on their customs papers for their van. 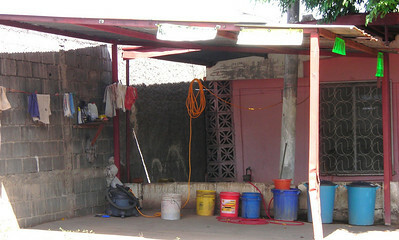 I offer to guide them through the process in Managua to get an extension. I walk into the customs building and hand over my switchblade to the guard. He gives me a big smile and puts the knife in his shirt pocket again. I go over to the manager's office who has been helping me. She says she is just waiting for an email from the border post where I crossed into Nicaragua for a confirmation of their mistake. Peter and I talk for about 2 hours before I get the word that the email is in and everything is good. I wait for another 15 minutes for the manager to have my new customs papers typed up. She then tells me everything is set and that I just have to wait for the Director General of Customs to sign it. He gets in at 3:00 PM, only 3 and a half hours from now. 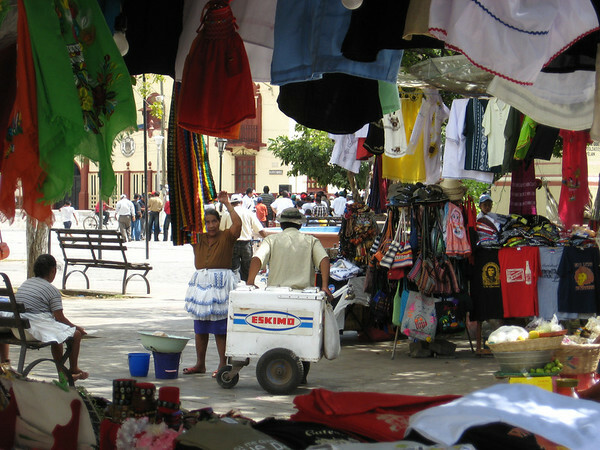 Peter and I go off marching through Managua in search of some food and an internet café. I want to let Heidi know what's up and that depending how long this takes I may end up staying the night here. An hour later we find internet. Another half hour we find a string of restaurants along the shores of Lake Managua. After peeking in a half dozen restaurants, Peter and I finally find one where the music is playing at a tolerable volume. We have a nice lunch looking out at the lake. Peter is an interesting guy. He and his wife retired ten years ago and purchased a large motor cruiser to sail between Alaska and Mexico. They went cruising every year for ten years. 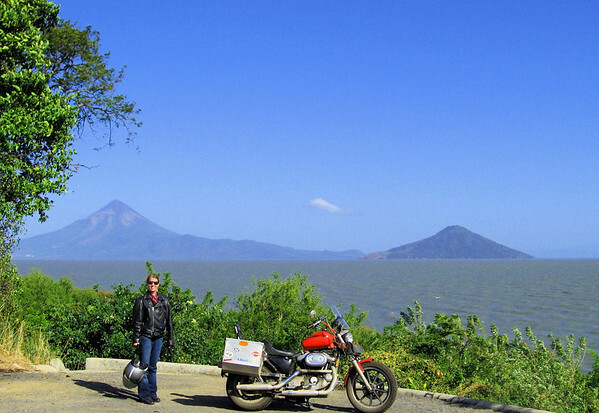 Now, after selling the boat they are on their first overland trip of Central America. A little after 3:00 we are back at the customs office. Ten minutes later the girl hands me with a big smile the new corrected customs papers. I tell her I now need to get a 30 day extension. She goes off to talk with someone about this. Later she comes back telling me that I can't get the extension until 1 or 2 days before my papers expire. 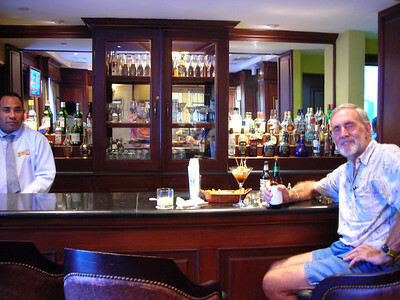 I thank her a thousand times (Mil gracias) Peter and I go off in search of a bar….. I hope you enjoyed my little story…….. I met a backpacker couple at a coffee shop in Esteli who raved about Leon and the beaches close by. They said Leon was the highlight of their whole trip. They also said they didn't think much of Granada saying it has a busy feel. Leon, time to check it out and Heidi wants to come along. All Right. The bike is emptied out except for some overnight stuff and tools. Our buddies see us off from our apartment. I'm really liken' this a lot. 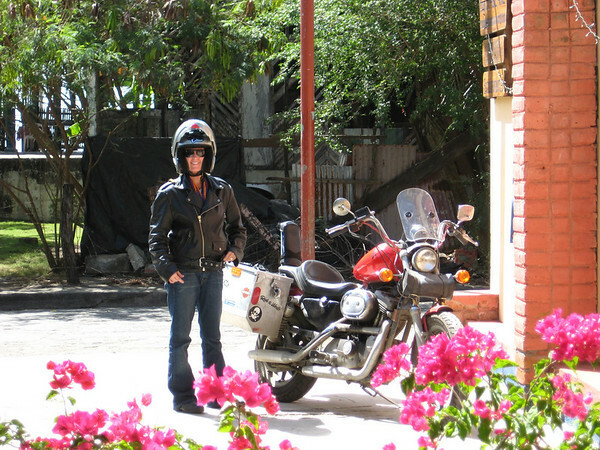 The bike feels nimble, Heidi is looking good and we are on our way to explore a new part of Nicaragua. 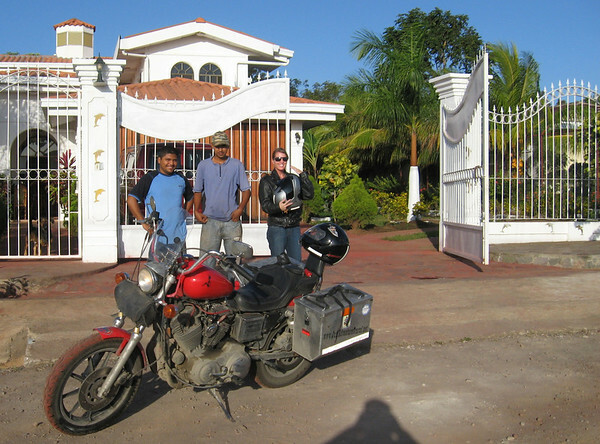 During research before this trip a Harley Davidson shop in Managua popped up. The tires are still OK but two new tires now at this shop would feel good. The shop manager and I emailed back and forth a few times but he doesn't have any tires for me in stock, then thying to order 2 tires if I pay up front. That was over a week ago and I haven't heard anything back, bummer, I'm sure it was my poor Spanish writting skills. The plan for new tires in Panama City like originally planned still works. Managua Harley shop, I have to get a shot. Managua Lake is like a volcano city. We tool through Leon and head down the hellish 12 mile road to the Pacific coast and the town Poneloyo. The village seems like a ghost town. We ride onto the beach between two hotels. The hotels looks abandoned with no glass on the windows and nothing inside. Wooow… We ride to the end of the beach and see some fisherman mending their nets. Now hungry for breakfast and none of the restaurants look like they are open for business. We ride back toward the center of town where a guy comes running out. I stop and he says "Desayuno" (breakfast) to us. We are on it. A nice little hotel and restaurant. We both have eggs, rice, beans with tortillas, one bottle of water, one bottle of OJ and two beers. $6.00. What a deal. The rooms of the hotel look a little dungeons. The plan was to spend the night here but couldn't find any reason to stay now so decide to head back to Leon to look for a hotel there. Just more fun. We enjoy a great ride back to our hotel apartment. All in all is was a great ride and a great day.